RoboCop is a 1987 science fiction film directed by Paul Verhoeven. 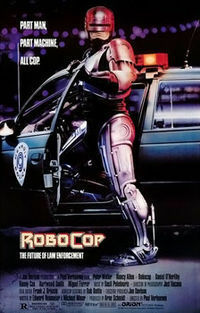 Set in a crime-ridden Detroit, Michigan in the near future, RoboCop centers on a police officer who is murdered brutally and subsequently re-created as a super-human cyborg known as "RoboCop". RoboCop includes larger themes regarding the media, gentrification and human nature in addition to being an action film. It has spawned merchandise, two sequels, four television series, video games and two comic book adaptations. The film features Peter Weller, Dan O'Herlihy, Kurtwood Smith, Nancy Allen, Miguel Ferrer and Ronny Cox.